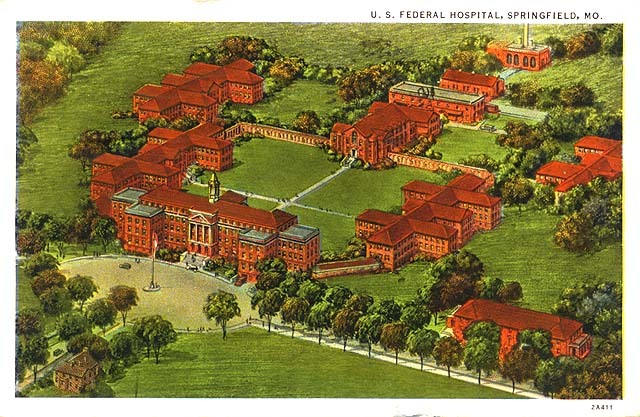 This postcard is an architect's drawing of the buildings that form the United States Medical Center for Federal Prisoners. The main building, which faces east, is west of the oval cement area. The mess hall, auditorium and kitchen are directly across the quadrangle west of the main building. The storehouse, laundry and boiler room are west of the mess halls. A treatment building is to the left of the main building in the foreground. The general medical building is to the left of the main building in the background. The acute care building is to the right of the main building in the foreground. 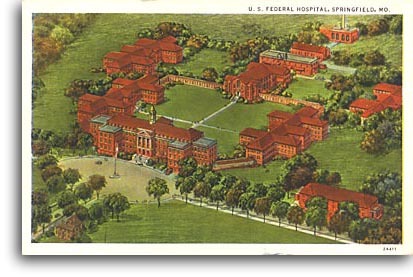 Attendants' and nurses' dormitories are shown directly north of the cement area in the lower right part of the picture. Some of the staff buildings, of which there are six, are shown along the road leading toward the main building. The clinical director and superintendent's quarters are not shown in the drawing.